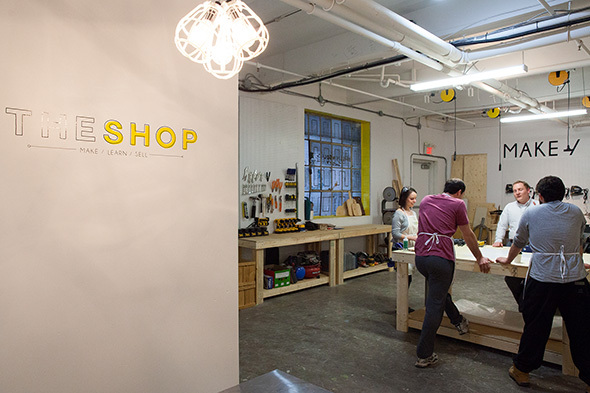 The Shop is a community-based maker space located in Brockton Village. The creative facility, based on the ground floor of a converted loft building at 1139 College St., presents a solution to the workspace woes of Toronto's space-skint DIY-ers. The facility is part of Make Works, a multi-use workspace that rents out units to a number of DIY co-working studios, including a 3D print shop. The Shop's founders, Marissa Maislin and Michelle Organ, opened the doors to the space just last month, but the project has been in the planning stages for nearly a year. The childhood friends and art-school grads wanted to create an inclusive environment for members to work on their projects, or, as Maislin puts it, "somewhere that any person can go, at any skill level and realize their creativity". The spacious workshop is fully equipped with everything you might need for a small to medium sized project, including four massive work surfaces and wall mounted benches that surround the room. 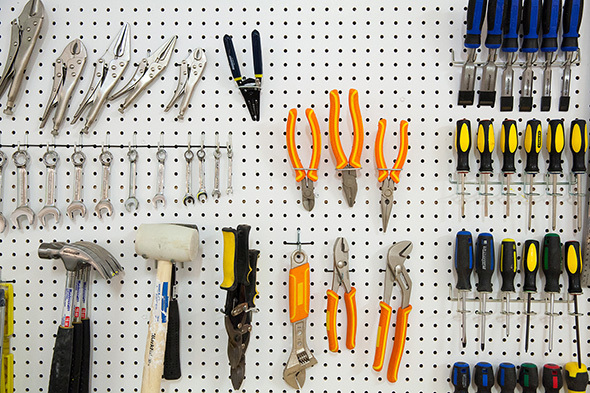 They're fully stocked with new power and hand tools, drill presses - even a kiln. A fully-functioning metal shop is in the planning stages and is expected within a few weeks. The Shop seems to be aiming for clients with lighter grade projects (you probably wouldn't exactly find full-sized MIG welders anyhow, based on the space's ventilation and code requirements). 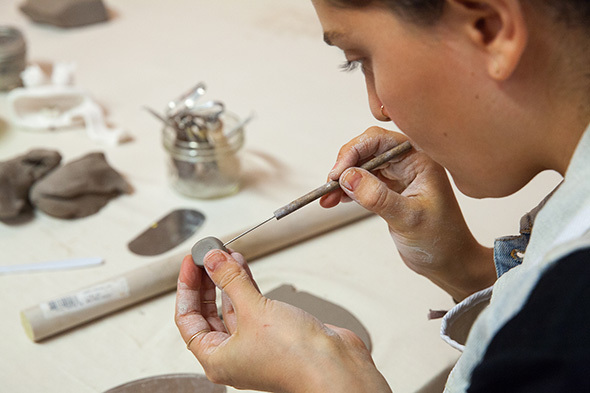 Maislin and Organ's background in fine arts lends a multidisciplinary approach to their plans, incorporating ceramic, metal and woodworking facilities under one roof - something Organ claims is unique among Toronto's maker spaces. Access to The Shop is membership-based, set at $95 per month, with the option of a day pass for $25. The pitch: They provide the tools, tables, equipment and wi-fi, and members provide their own ideas and materials. 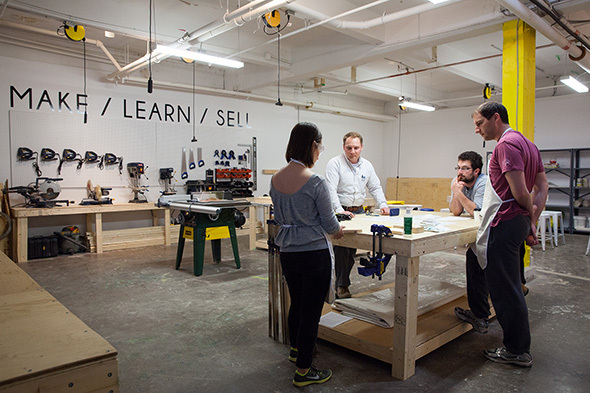 This rate is generally comparable, if slightly cheaper, than other maker spaces available in the city, but is optimized to appeal to those who might feel a bit intimidated in a workshop setting. 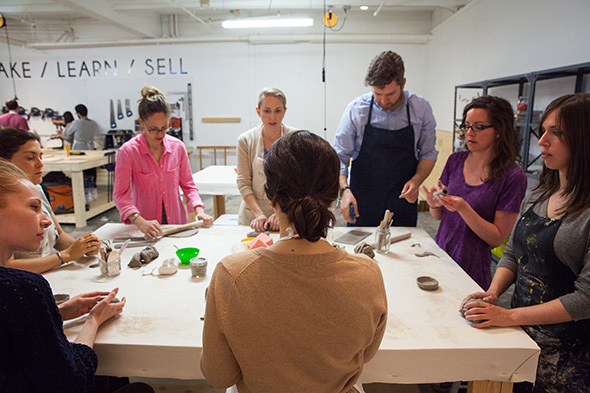 Workshop tutorials have been a popular option for new makers, with diverse subjects taught throughout the spring. 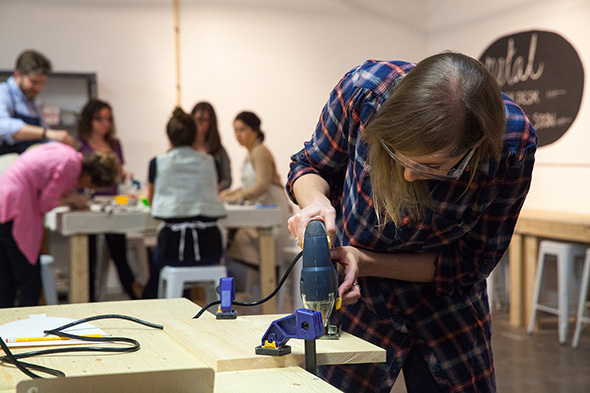 May is well-stocked with classes including wood letter cutting, linocut, and screen printing tutorials - an interesting combination of trades and arty handcraft. 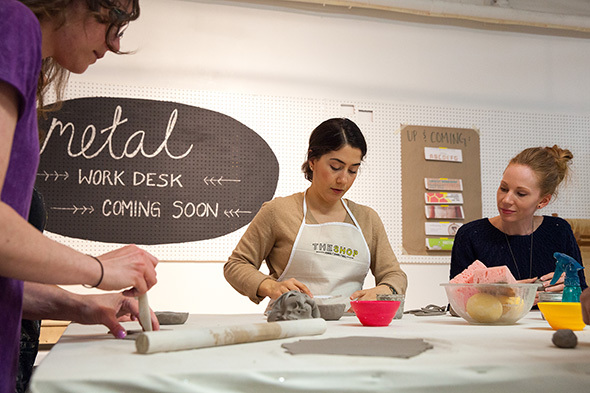 You don't have to be a member to join a workshop; they're quite inexpensive, and it's a great way to survey the space and its services. Eventually, the two founders hope to develop 'Shop The Shop,' a retail space that sells only handmade goods created by its members - like a kind of real-time Etsy. 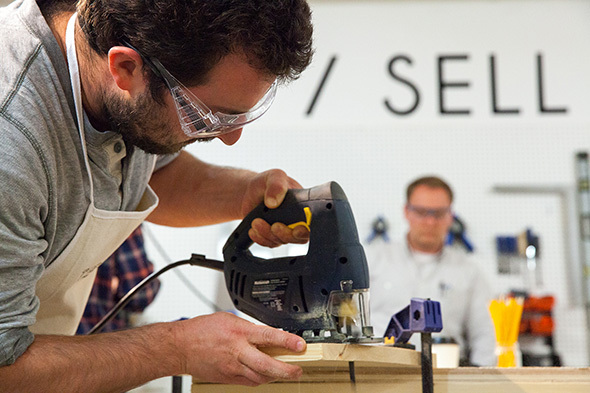 The real dream, though, is to foster an interactive community of collaboration within The Shop, where members of all skill sets support each others projects from conception to sale, in an inclusive and fun environment. Writing by Tom Morgan. Photos by James C. Lee.